The Professional Property Manager’s Guide to the Violence Against Women Act (Digital Delivery) – A. J. Johnson Consulting Services, Inc. The Violence Against Women Act (VAWA) became law in 1994. One of the specific areas of protection under the law is federally assisted housing, including programs administered by the Department of Housing & Urban Development (HUD), the Rural Housing Service (RHS), and properties that received credits under the Low-Income Housing Tax Credit Program (LIHTC). At this time, there has been very little guidance provided as to how to meet the requirements of VAWA for LIHTC properties, and not much more for RHS properties. However, HUD has issued detailed requirements for their programs, and this Guide has been prepared primarily to assist HUD properties in complying with the requirements of VAWA. However, it is also a resource for RHS and LIHTC properties in understanding what the law requires and developing in-house policies to comply with those laws. The Guide covers every requirement of the law (in place as of the time of publication), including the most recent guidance from HUD – Notice H 2017-05, which was published by HUD on June 30, 2017. The Guide outlines who is protected by VAWA, owner related certification and documentation requirements and a detailed explanation of required notices. Details on how to develop an Emergency Transfer Plan and deal with lease bifurcation issues are included and the Guide contains exhibits on the Model Notice of Occupancy Rights, Emergency Transfer Plan, Certification of Domestic Violence, Dating Violence, Sexual Assault or Stalking, and the Emergency Transfer Request Form for use by residents. 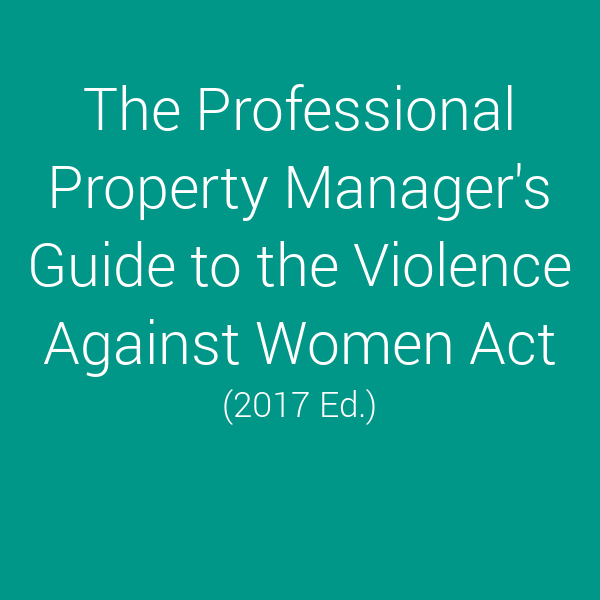 The Professional Property Manager’s Guide to the Violence Against Women Act is intended to be kept on the users computer for quick and easy reference.